Early in the 1970s, public access television stations were created as a non-commerical media format for the general public to create television programs to air on cable TV. Public-access television is often grouped with public, educational, and government access television channels, by the acronym PEG. PEG Channels are typically only available on cable television systems and are funded by public access fees paid by cable subscribers and state mandated support from the cable companies themselves. 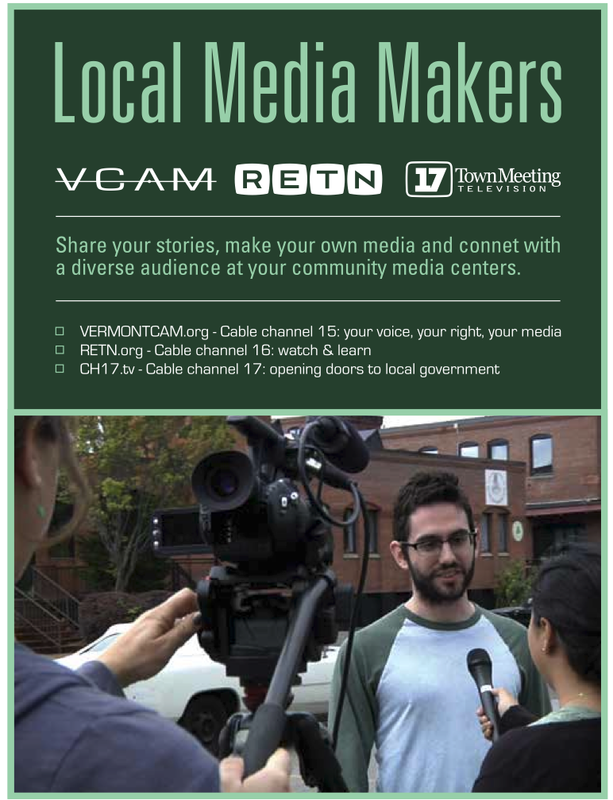 In Vermont’s Chittenden County has three community media making centers, each focusing on a different element of public access television. Each center’s media making tools are free to any member of the public residing in much of Chittenden County (each channel’s viewing area). Depending on your interest, one of the stations can help you create a TV show, shoot a film, cover a local event, or access local government meetings. Government and politics – CCTV/Channel 17/Town Meeting – cable channel 17. Launched in 1984, CCTV Center for Media & Democracy expands the reach of your organization. They provide channels , tools, and training to get your message across and help you make a difference in our community. Education – Regional Educational Television Network (RETN) – cable channel 16. RETN makes media and technology accessible for all students and lifelong learners to advance education and civic engagement. RETN serves our community by working with local schools, scholars, artists, businesses and nonprofit organizations. We provide access to the training and tools you need to create and distribute your video projects. Whether you’re looking for help getting started with video production or are interested in volunteer or internship opportunities, there are a variety of ways to get involved with RETN. Creative, variety, and opinion – Vermont Community Access Media – cable channel 15. VCAM’s mission is to promote free speech, civic engagement, government transparency and public dialogue by enabling easy access to the expanding world of media. VCAM does this by providing the public training in and access to the tools and techniques of digital video, and by producing and distributing locally relevant noncommercial content via digital media outlets. All three media centers are located in Burlington, VT and are part of the network of public access centers located around the state of Vermont. Learn more about Vermont’s Access Network of centers. Access state of the art digital media equipment for free!